There are many adjectives that could be used to describe the online game, it's certainly exciting, wonderful and a lot of fun. When we landed at Glorious Bingo we were a little disappointed given the brand name, the design doesn't really live up to the expectation that name instils. 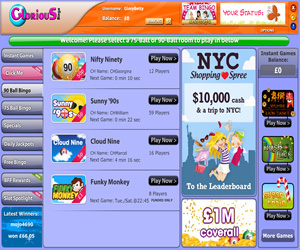 The moment you hit the homepage you are bombarded with game information though, free bingo offers, cash match bonuses and big jackpots, so it all looks very promising indeed. 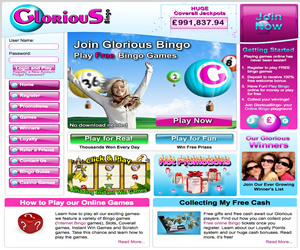 Glorious Bingo is run using the 888/Globalcom software and is part of the Dragonfish network. Signing up for a new account is really simple and takes just a few moments, and while they ask for your card details straight off, you can skip this section if you'd prefer to play a few free bingo games and try out the site first. Free Bingo All is the no cost room at the site open to all players, even those yet to make a deposit, and offers free games from 7am until 7pm daily with £1 jackpots. If you are signed up with any other site on the Dragonfish network, you may find you need to come up with a unique username, but apart from that you can play at as many network sites as you wish. The theme at Glorious Bingo is simple and easy on the eye too, with a bright white background and pink and blue colour theme on the homepage. The game rooms are of standard design to the network, simple and built with the user in mind. Tickets are to the left of the screen, and chat is to the right. Around the edges of the game screen you'll see game options to personalise your game, progressive jackpot details and a range of mini-games. The games play well, faultlessly in fact, as expected on this popular software platform and is second to none. The chat rooms are busy, as are the bingo rooms and you can expect a warm welcome from the chat host on duty. When you are ready to make a deposit there are some generous sign up bonuses to be claimed, and once you are a depositing player you can take full advantage of the site, the jackpot games and the chat games playing in the chat rooms around the clock. 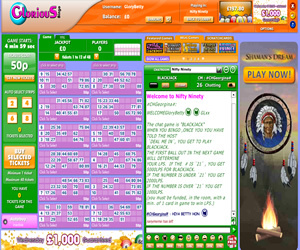 If you do like playing mini-games there are a huge selection to play at Glorious Bingo, from big named slots to instant wins and casino games, you'll find them all, and they all play in a pop out window if you wish to continue with your bingo games at the same time. And what a lot of bingo there is. There are a huge selection of rooms, offering both 90-ball and 75-ball bingo, and with regular promotions, big jackpots including the £1 million coverall, and regular prize games, you should find this site very glorious indeed. Every week you can take a look at the Bingazette from Glorious Bingo, keeping you abreast of all the big games and exciting promotions coming up over the next week, making this site not just appealing, but informative and user-friendly too. Sadly the brand doesn't stand our from the crowd but if you love Dragonfish brands and the 888/Globalcom software, you're sure to have a 'Glorious' time playing at this site. 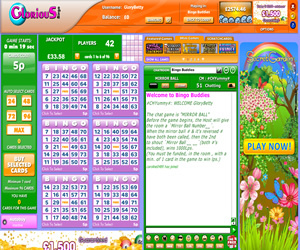 Glorious Bingo offers three variants of the bingo game at their site. Most games are either 75 ball pattern or 90 ball bingo but there are rooms that offer 75 ball five-line games too. You will find a selection of instant win games like slots, scratchcards and table games available, some of which can be played in the same room as your bingo. For deposit bonuses a minimum of £10 is required. Wagering requirements at Glorious Bingo are 4x the amount of deposit and bonus but you can withdraw prior to meeting these requirements. However, should you not have met the wagering then your bonus money in your account at the time of withdrawal will be lost. Before you can withdraw you must have deposited at least £30 into your account.